In tandem with our web site design services, we typically recommend that your new site be based upon a widely implemented Content Management System (CMS). We recommend CMS because it is easier for you to update your site, it provides a template-driven system with a standard look, and provides you long-term scalability. We review your requirements and help you select the right CMS for your needs. Our CMS of choice is Joomla! because it fits the criteria of being secure, easy to update, template-based, scalable, nicely constructed, and widely supported, but we also implement WordPress, too. Joomla allows you to manage the site yourself (if that is your preference), new tools are easily available (over 8,400 available plug-ins), and there are many companies able to offer long-term support. The last item is important because we have performed numerous "web rescues", where an over-burdened or less-than-ethical web designer no longer cares for your needs, leaving you unable to make changes to your site. 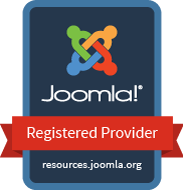 Best of all, Joomla! is free, as are most of the plug-ins. We are able to help you implement and configure tools that significantly broaden the functionality of your site with applications like personalization, forums, and shopping carts, with minimal product costs and little to no site modification. This factor tremendously increases the return on investment you receive from your web site. Depending upon your need, WordPress may be the simplest approach, especially for simple blogging or a "brochure" site with few moving parts. WordPress can be a very low-cost, quick entry onto the web. and we can learn most environments very quickly!